Unai Emery ahead of Arsenal's trip to Huddersfield Town on Saturday has revealed the latest injury news and health updates. The Spanish boss disclosed that Pierre-Emerick Aubameyang and Laurent Koscielny have been battling illness. The skipper and Gabonese fell ill on Wednesday and Thursday respectively but will still travel to the John Smith's Stadium with the rest of their teammates. 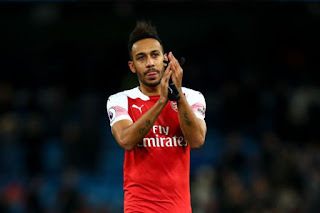 "Today is sick, but I think is good for Saturday, Aubameyang", stated Emery. "Yesterday was sick, Laurent Koscielny, but today is training well." The Gunners have struggled in the absence of Hector Bellerin and with Stephan Lichtsteiner failing to handle that spot properly as a deputy, it is good news that Ainsley Maitland-Niles is back with the team following a 10-day break via a fitness issue. The Hale End Academy product who had been at the Emirates since the age of six could not be fit in time to participate in last weekend's encounter against Manchester City but is in contention for Saturday. Also back is Henrikh Mkhitayran having been tied down by a foot injury for the last six weeks. A place in the squad for the next game is likely. "We thought first, last week, after six weeks being injured, it was not enough [for Mkhitaryan] to play against Manchester City", the former PSG boss told the press. "But after this week, playing first with the U23s and then working with us, it’s the first time I can think with him being us. It is a nice thing to see a number of injured Arsenal players making timely returns. Shkodran Mustafi, Granit Xhaka and Sokratis Papastathopoulos have all made comebacks. A win is all the North Londoners need against Huddersfield to maintain their hopes of securing a Champions League spot by putting pressure on Manchester United and Chelsea who are fifth and fourth respectively. In case you missed the latest injury news on some other players posted today, you can check it out here.